To the memory of Dan Tsalka. Among the acts of art vandalism blamed on the nineteenth century, one of the minor ones was actually undone fifteen years ago. 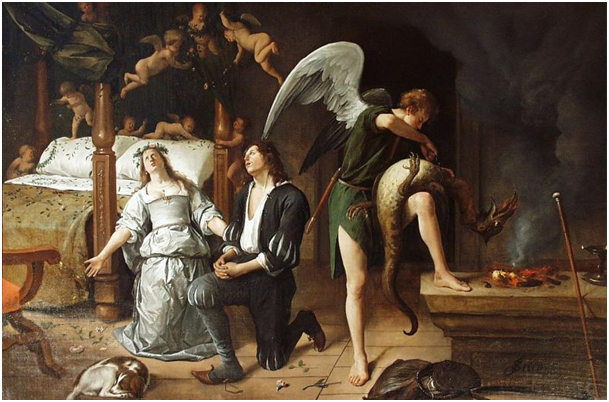 It had to do with the dismemberment of a painting by Jan Steen of the wedding night of Sarah and Tobias, a story from the apocryphal book of Tobit or Tobias. Sarah had been married seven times, but on each of her seven wedding nights her groom had been killed by the demon Asmodeus before the marriage could be consummated. Tobias was her eighth husband, but he enjoyed the protection of the archangel Raphael and by following Raphael’s instructions for the wedding night and sacrificing a burnt offering instead of diving straight into bed with his bride, he survived and he and Sarah lived happily ever after. 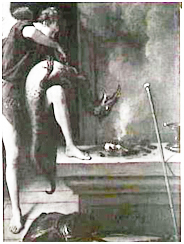 The right side of Steen’s painting shows Raphael subduing Asmodeus on the altar where Tobias had burnt the heart and liver of a fish that he, on Raphael’s instruction, had caught and gutted on the way to Sarah’s house. On the left we see what happens next: saved but delaying their nuptial bond, Tobias and Sarah, on Tobias’s initiative, are praying to God for continued protection. Tobias assures God that he is bedding Sarah, whom he calls his sister, not out of horniness but in pious sincerity. At a given moment in the nineteenth or eighteenth or even according to some the seventeenth century, someone took a knife to the painting and separated the praying couple from the angel, demon and sacrifice. The right section, without the clue offered by the rest of the composition, proved too difficult for art historians to interpret. After some unnecessary polemics about whether the subject was an allegory or not, whether the painting was a signboard or not and whether the main figure was Raphael or Michael or Daniel, the subject was identified properly in 1926 by the student of Dutch literature G.J. Boekenoogen. Still, it was not until 1960 that the correctness of this interpretation was accepted by the last die-hard. The painting was acquired before 1907 by Hofstede de Groot’s colleague Abraham Bredius and was bequeathed by him upon his death in 1946 to the city of The Hague as part of the Bredius Museum. The left side did not emerge until the 1920s. It was published in 1928 by Cornelis Hofstede de Groot, who recognized its relation to the angel. In 1940 the painting belonged to the Dutch Jewish art dealer Jacques Goudstikker when he died while fleeing the country after the German invasion. During the war it was seized by the German occupiers of the Netherlands. In 1945 it was returned to Netherlands, where, following years of negotiations with Goudstikker’s widow, it came to be regarded as national property and was deposited in the Centraal Museum in Utrecht. The clincher for recognition that the two canvases were part of the same painting came in 1965, when a cleaning of the wedding night uncovered the archangel’s right wing, which had been painted over. This was the situation in 1993, when the art historian Albert Blankert proposed that the harm of the separation be undone and the two halves reunited. This was accomplished successfully in 1996, with addition of a missing piece of the Raphael, and the resulting masterpiece was put on display in the Bredius Museum. The museum website has an item on the reconstruction athttp://www.museumbredius.nl/reconstr.htm. And then came 1997. Following the U.S. Senate investigations into the Swiss bank holdings of Jewish account holders killed in the Holocaust, attention turned to the art collections of victims all over Europe. The Dutch state proclaimed that statutes of limitation would be relaxed if good arguments could be brought by claimants. One of those to enter a claim was the widow of Goudstikker’s son Edo, Marei von Saher. 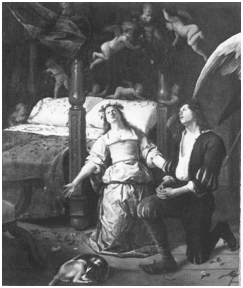 One of the more than 200 paintings that she claimed was the Jan Steen Wedding night of Tobias and Sarah. In 2006 she was awarded ownership of the entire remnant of the Goudstikker collection in Dutch hands, including the left section of the reunited painting in the Bredius Museum. Neither The Hague nor von Saher wanted the painting to be cut up again. Nonetheless, estimates of the value of the two pieces as separate paintings had to be made. The amounts assigned to them were $2,892,000 for the larger, more attractive left part belonging to von Saher, and $913,263 for the angel and the demon belonging to the Bredius Museum. Since the township has no intention of paying her for her part, the two parties began to manoeuvre toward a sale of the Bredius fragment to her, for $913.263 plus €45,000 for the cost of restoration and reconstruction. On 4 June 2009 the township submitted a request to the courts to allow it to sell Raphael and Asmodeus. This was too much for lots of Dutch museum people and art historians who had applauded the rejoining of the mutilated masterpiece for display in a Dutch museum. A committee formed of the director and a past director of the Rijksmuseum, the retired director of the Mauritshuis and other major players set up a Foundation for the Protection and Preservation of Art owned by Dutch Public Organs. Family members of Abraham Bredius joined with them, reminding the world that Bredius attached to his bequest the condition that the legacy be displayed in perpetuity in the Bredius Museum. On 22 October 2009 the Foundation and the Bredius family entered counterpleas to block the request of The Hague to allow it to sell its share of the Jan Steen. On 17 December the court will adjudicate the plea. If it is turned down, the Dutch museums will lose a painting that not only for its artistic value but also its unique story deserves to be on display here forever. Does anyone out there know Mrs. von Saher? Even if her experiences with the Dutch state and its institutions have not been uniformly pleasant, I cannot imagine that she has no sympathy for the Bredius Museum and its visitors. The Jan Steen case offers her an opportunity in life that few of us can hope to experience. She can play the role of the good mother who solves a Solomonic dilemma by giving her section of the Jan Steen to the Bredius Museum on indefinite loan if not in possession. If anyone does know her, please forward this column to her. © 2009 Gary Schwartz. First published on the Schwartzlist on 8 December 2009. This story has personal meaning for me. In 1994 I published a novel called Dutch Kills, brought out in English in 1996 under the title Bets and scams: a novel of the art world and in 2000 in German as Liebe eines Kunsthändlers. In it I described a deal made by a young Dutch art dealer named Lodewijk Altstad. I used what I knew about the Jan Steen Wedding night of Sarah and Tobias to allow Altstad to sell the demon to the museum that owned the bridal couple, which I called the Reynolds Museum. I placed it in Houston, Texas, so that unlike the Bredius Museum, the museum would have the money to buy the missing half of its painting. The case of the dismembered Jan Steen was closed when he and Henry Walker put the two paintings side by side in the restoration department of the Reynolds. It was obvious at a glance that Altstad was right. The two fragments were the same height, and their combined width produced a landscape format of classical proportions. The picture space, the scale of the figures and the tonality interlocked seamlessly. To expel all doubt, the smoke rising from the incense dish on the left of the bridal chamber began forming a loop which came round to the right of the demon. After some two hundred and fifty years, Steen’s composition returned to view. I took some additional poetic liberties with the case, beside format and the wisp of smoke, but in essence I was anticipating the re-unification of the Hague fragments two years later. The prices I assigned to the two parts of the painting were $2,500,000 for the Wedding night and $1,000,000 for the demon. I was twenty years ahead of my time. The novel got some nice reviews but didn’t burn up the marketplace. In discussing the draft with my late friend Dan Tsalka, the Israeli novelist, he gave me advice that I did not but possibly should have followed. “Your crime story is OK, but the art story is much better. You should rework the plot and turn the discovery of the two parts of the painting into the climax.” That is my reason for dedicating this column to his dear memory. Previous Previous post: 300 O Solomon, where art thou?